This morning another Cal Thomas column greeted me courtesy of the Spokesman Review. He disconnectedly rambles and pontificates on adultery and the voice of temptation. Gov. Sanford should have been familiar with the voice because of the Bible studies he attended. The voice began seducing humanity a long time ago... The voice told them that God knew that if they ate of the tree of knowledge of good and evil they would be like God. Here he picks and chooses from the Bible. Adam was also told (and Eve knew of this and repeated it to the serpent), "But of the tree of the knowledge of good and evil, thou shalt not eat of it: for in the day that thou eatest thereof thou shalt surely die." They ate and did not die. So they were twice deceived. Good marriages are the result of hard work. Forsaking all others is more than a wedding promise. It is a daily denial of one’s lower instincts. Temptation is everywhere. The key to overcoming it is to realize you are fighting an adversarial force that wants to destroy you, embarrass you and cause ridicule to be heaped on the God you claim to worship. There is so much more to a good marriage than forsaking all others in a daily denial of one's lower instincts. I get the feeling he holds a pretty low opinion of people. There's temptation everywhere? Since Thomas speaks only of men throughout the column, just who is the temptation coming from? That danged Eve fooled me again! I once asked evangelist Billy Graham if he experienced temptations of the flesh when he was young. He said, “of course.” How did he deal with them? With passion he responded, “I asked God to strike me dead before He ever allowed me to dishonor Him in that way.” That is the kind of seriousness one needs to overcome the temptations of a corrupt culture in which shameful behavior is too often paraded in the streets. What's interesting about this is that throughout the column Thomas addresses this from the perspective of man acting of his own free will and suffering the consequences of his choices. Graham's answer is from the perspective that God "allows" him to stray. Graham asks that he suffer the consequences should God allow him to choose poorly. That sort of seriousness may work for whatever shameful behavior our corrupt culture--there's that low opinion of us again--parades in the streets, but it doesn't do much for the man, or woman, in the driver's seat. Any man who has sought the help of God and other men in helping him to honor his marriage promises to his wife and children is a hero, especially in today’s morally exhausted culture. What of the men--again, why are we only speaking of men?--who keep their marriage promise without any help? Are they not heroes? Maybe superheroes? Is our society that morally exhausted? (More low opinion.) Or does that type of news attract more viewers? What is the news anchor going to tease you with? "When we come back another governor is caught cheating on his wife." Or, "Another governor has remained faithful to his wife for yet another year bringing his grand total to 26 years of faithful marriage to the same woman." You can never take a marriage — or the voice — for granted; it’s always on the prowl looking for new people to destroy. Marriage is always on the prowl looking for new people to destroy? I don't think he meant to say that. Well, officer, while I was locking the door the key got stuck. I couldn't just leave it so I took the door off. Otherwise somebody could steal it. Despite the fact that Barack Obama's birth certificate shows he was born in Hawaii, there are plenty of people who think he was born elsewhere and want him to prove he is a natural born citizen. To help bring this to our attention there are at least five billboards across the country designed to capture our attention with the question, "Where's the birth certificate?" I'm curious how some people are satisfied with the proof that answers the question of birth date, time and place for every other citizen of the United States with the exception of one man only. I took a break from installing new floor trim to watch four Mead High School cross country teammates, Josh included, play their second game at Hoopfest. They're a hoot to watch. They only shoot three-pointers (which are really two-pointers at Hoopfest). They don't intentionally foul. They don't call fouls. They have no attitude and ignore those who do. They lost this game 20-4 and had a ridiculously fun time doing so. In their first game the other team got upset because they paid good money to compete and Pen Island guys were playing soft instead of taking the game seriously. Yeah, I couldn't resist getting at least one in. What with the many issues like war, poverty, climate change, health care, crime, etc., it's refreshing to see that we know what's really important to pay attention to. Last week I mentioned a cyclist who would be passing through here while riding from Seattle to St Louis. I gave him directions for getting on the Centennial Trail so he'd have a more enjoyable ride through Spokane. Apparently, he enjoyed the trail very much since he posted this on his blog. Thanks Hank for telling me about the Centennial Trail!! It was a little confusing around the city, but going along the creek was amazing, thanks again!! Well, everyone, I wish I could say it's been a pleasure. I wish I could say how much I enjoyed your bickering, your backstabbing, your whining and complaining and your last-minute demands. I wish I could say a lot of things but in the interest of brevity--and that fact that now I have better things to do with my time!! !--I'll keep this short. I out of here! My prayers have been answered and effectively immediately I no longer work with you! Never mind, I misread one of the numbers on my lottery ticket. See you tomorrow! This sign is at the bottom of Mayfair just north of the intersection with Cleveland. The street is a one-way for vehicles, but two-way for bicycles. 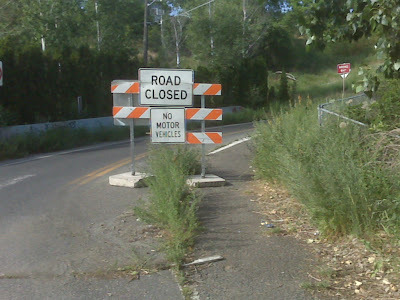 A couple of weeks ago someone moved the sign so that it impedes the bike lane. I called the Spokane Street Department who at first relayed that the foreman--who I'm guessing is probably not a cyclist--said there's enough room for a bike. I politely asserted that there is just enough room (as you can see from the photo) which is not the same. There was definitely the hazard of catching an arm or handlebar and so both Kathy and I--and quite likely other cyclists--were swerving into the oncoming lane to get around the sign. Not only did they move the sign out last Friday, but they also cleaned up much of the debris in the bike lanes. And yesterday they whacked all the weeds along the sides of the road. Nice! In a recently released statement Cathy McMorris Rodgers claims to be concerned about your health care but not in a way that really helps people who can't afford health insurance or get dropped by their insurance company. I believe we are facing a serious health care crisis and we must do everything we can to fix this problem. Everywhere I go I hear about the lack of doctors and nurses, the high cost of health insurance, and limited access to quality health care. As I approach the current health care debate, I believe the most appropriate solutions should focus on making health insurance more affordable for individuals, small businesses and their employees. Tax credits and deductions can help. In rural areas especially, we need to increase the number of health care providers, with incentives and fair reimbursements for doctors and pharmacists. Finally, I believe we must empower parents to make healthy choices for their families and choose the treatments they need in consultation with a doctor they trust. I would not want anyone else deciding what doctor or treatment my son receives, and I insist that every parent have that same freedom. Insurance companies are not competing with each other to get your business. They are primarily interested in keeping customers who generate less expense and getting rid of those who generate more. They can limit your choice as to which doctor and treatment you receive which is probably something many people are already familiar with. Tax credits and deductions for the consumer do nothing to change the insurance company's behavior. They might make it more affordable for small businesses, but really, is it going to make that much of a difference for them? Nothing in her complete statement reflects concern with or real solutions to the dramatic effect medical costs have on the population. And she doesn't address what the people want. She may agree that the system needs to be fixed, but her solution involves ideas that have failed us already and essentially maintains the status quo. 1. The defendant must have been acting under color of law. 2. The conduct of the defendant must have deprived the victim of some right secured or protected by the Constitution of the United States. 3. The defendant must have acted willfully, that is, with a specific intent to violate the protected constitutional right. 4. The offense must have resulted in bodily injury to the victim. I think #3 will be key. From the few jury instructions I've found, the requisite "specific intent" is the intent to use more force than is necessary under the circumstances. Based on what I read in the city's latest response to the civil lawsuit I think the use of force will be the main issue of the trial. I reviewed the city's filing (PDF format). 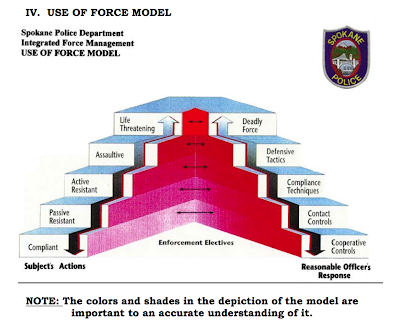 Included is a graphic image of the Spokane Police Department's Use of Force Model. The Department's use of force model is designed to proportionally align the officer's use of force with the subject’s actions. Officers should respond to the subject’s actions in order to gain compliance and control, based on training and continual risk assessment of the circumstances. Timing is an important element of the risk assessment process and is demonstrated by the officer's response to the actions of the subject, measured in terms of immediacy and necessity. This is followed by a lengthy description of the model correlating a suspect's actions with the officer's response. Have a look at that. Now let's review Officer Thompson's statement (PDF format) taken on March 22, 2006. It's pretty interesting. For one, there seem to be several leading questions on the part of the detective asking him questions. One point that strikes me is his description of Zehm and the importance he places on the fact that Zehm is wearing a leather motorcycle-style jacket. He's concerned the jacket, as a form of soft armor, will protect the person from use of force by the officer. The jacket could also defeat the user of a taser. That's an interesting frame of mind to have. (Motorcycle riders should make note of this.) But at the end of the paragraph he does mention that the coat could conceal a weapon and the detective keys on that when he continues. It's interesting to see all the backtracking so he can include things like his concern that cans and jars in the store could be used as possible weapons, his description of Otto Zehm's facial expressions, tone of voice, and body posture as Thompson felt threatened by the 2-liter bottle of pop. Did it never occur to him to back off a step and wait for another officer to arrive? Based on the extreme physical resistance and uh efforts and the body size of the suspect was he was, he was stocky in his build. Urn, he had just undergone the same effort as I think I had only more so in his physical exhaustion uh in fighting and resisting and we've been trained to recognize the potential for what's called uh manic exhaustive syndrome. That especially if drugs are on board. It's also been my experience that this is applied as well to people who are experiencing a psychotic episode. Who, their body uh through whether it's through paranoia or delusions or hallucinations, uh their body undergoes such physical duress. Uh, in this case it was resisting and fighting and especially after he was handcuffed. Urn, that it puts a body into shock and uh maybe cardiac arrest or you know, something stops the person's heart. Uh, I mean I had seen, I had seen at least one situation 20 years before the title even came out of what this phenomena is that to be aware of. So yeah, several of us looked at it and said looks like the effects of Manic Exhaustive Syndrome here. Nice recovery on the cardiac arrest clarification. Thompson brings up "manic exhaustive syndrome" which I can only find mentioned in deaths from the use of a taser. I can't find any studies, medical papers, etc., that describe it. Aside from all the nitpicking I can do with his statement, I think it's important to focus on Thompson's use of force and see if it fits within the department's model. That is going to be the key issue in this case. After looking at the Zip Trip video I can see one possible reason why Thompson is charged with making a false statement. In his statement he describes how he approached Otto Zehm and told him to drop the pop bottle. Zehm asked, "Why" and Thompson said he repeated the order twice as loud to which Zehm replied, "No". That would take a few seconds. In the video Thompson enters the store and quickly engages Zehm. We get some really cool looking sunsets here. Tonight the clouds looked like a smoking hot lava field. An article in the Wichita Eagle describes what a miracle it is that a young man survived a severe skull fracture and the resulting swelling of his brain. [A Vatican investigator] will investigate on behalf of the church in Rome whether 20-year-old Chase Kear's survival qualifies as a miracle; whether he survived a severe head injury last year in part because his family and hundreds of friends successfully prayed thousands of prayers to the soul of Father Emil Kapaun, a U.S. Army chaplain from Pilsen, Kan., who died a hero in the Korean War. When something occurs that's beyond our capability to explain--and mostly when it's a good outcome--we curiously try to attribute that to a higher power. If the outcome is bad then the higher power chose not to intercede. Years of constantly improving medical intervention has limited those miraculous survivors to fewer and fewer extreme cases. Two hundred years ago a woman surviving giving birth by Ceasarian section--an extreme last resort--would have been miraculous. Now it's common place--and not such a last resort--in the modern world. Had the young man not survived, would his family have questioned whether their fellow parishioners prayed hard enough to be successful? Probably not. More than likely it would have been "God's will" and not the fact that the trauma caused his brain to swell enough to kill him. Kevin is Stephanie's tadpole. She rescued him (her?) from Josh's biology classwork when he and a classmate had to gather and photograph a variety of insects and water creatures from the Little Spokane River. Kevin has been occupying a small aquarium and he's slowly getting larger and growing limbs. Today, Steph decided to change Kevin's water since the aquarium he is occupying was getting funky. She caught some rainwater in a large pan and then poured some in on Kevin. Kevin froze up and Steph realized the rainwater was kind of cold. She scooped him out in a small glass so he wouldn't be so cold and to give the tank time to warm. So how to check the temperature of the water? Steph got the thermometer. In her words she described it as "the one you stick in your face". It wasn't much use because it only showed "Low". No word on how she refers to that other type of thermometer. I'm making slow but sure progress. There are still some remnants of that big blister on the left foot and I managed to get a couple of small ones but they weren't any trouble at all. You'll notice there's an overall smoothness and thicker look to most of the skin. It has the leathery feel of a well-worn baseball glove. Twice this week I ran my three mile loop on the Centennial Trail and around Riverfront Park barefoot. It's mostly asphalt with some cement, pavers, wood (bridges) and grass. Running through the puddles yesterday was fun. It reminded me of playing barefoot football in the rain in a neighborhood and time long since past. Based on my experience so far, if I was starting over I would run barefoot on grass only to learn my new stride and work on that while running in shoes. I would walk on a variety of rough surfaces until I could walk for at least one mile without significant discomfort. Then I'd interject 1/2 to 1 mile of barefoot running during my regular runs and gradually increase that as it became more comfortable. I'm pretty good about trying to get the most of out things and make them last as long as possible, especially my bike gear since that can be somewhat pricey. After nine years and a couple cleat replacements my Shimano SPD shoes are ready to call it quits. The panniers I bought at the same time have had some restitching done and I've jerry-rigged some minor repairs. Their waterproof capability has faded over the years so I've always lined them with trash bags just to make sure my clothes, camera, etc., stayed dry especially in conditions like our recent downpours. Yesterday morning I rode in the rain for the first couple miles on the way to work. After the rain stopped I was still getting my feet and the panniers wet by splashing through the puddles on the roads. After arriving at work I removed my panniers and carried them to the office. I unpacked my pants and shirt, my socks, and then my underwear which I discovered were soaking wet. Whaaaat? My underwear were on the very bottom so I looked at the panniers. There's a hole there. And there was a hole in the trash bag, too, providing unfettered access to the water my rear tire splashed to the sides. I can't say for certain how that hole got there but the likely cause is from rubbing against the spokes. And how would that happen? Well, I have a tendency to dismiss odd sounds if I can't see their cause while I'm riding. It's a very poor practice and I don't recommend it. Three days ago I heard a strange tink tink tink on the way to work. I looked down at my wheels and chain rings while I was riding and didn't see anything. The noise stopped and I continued on my way. When I got to work one of the bungee cords holding my gym bag in place was gone. I was lucky I didn't wrap that up in my rear wheel. I've lost tail lights (and even a head light!) because I didn't stop and look after wondering, "What was that noise?" So it looks like learning has still not occurred--again. I'm guessing I heard the pannier rubbing against the spokes and thought something like, "Is that my front derailleur making that noise?" And then after dinking with the derailleur a bit the noise probably went away and I continued along in ignorance. Like I said my underwear was soaking wet. When you mention underwear some people go right into that boxers versus briefs debate. To me that's similar to the helmet versus no helmet conversation. Some people want security and protection and some people just want their freedom. I always wear a helmet but as far as underwear goes, let's just say that yesterday the point was moot. And if any of my workmates read this I can just imagine them holding their hands over their ears, closing their eyes and saying, "Too much information!" A couple weeks ago I saw this article about a middle school teacher planning to ride from Seattle to St Louis to raise money for a scholarship fund named for a young man who died of cancer. Long bicycle rides don't deter St. Jacob resident Tom King. A Collinsville Middle School physical education teacher, the avid cyclist is used to long country roads. But it's the longest of country roads that has him most excited - he plans to ride about 2,500 miles from Seattle to St. Louis over six weeks this summer to raise money. The goal is to spark publicity for a scholarship he created to honor Caleb Zarzecki, of Troy, who died of cancer in June. He was 15. The scholarship is for a Triad High School senior next year, when Caleb would have been in 12th grade. I emailed Tom with an offer of home-cooked meals and a comfortable room. He was grateful but he's staying with an aunt who lives in the Greenacres area. He leaves the Seattle area on June 21. You can follow him on his blog. He plans to do an average of 70 miles a day so we might see him pulling into Spokane Thursday evening. I've given him some route suggestions for passing through here. Any suggestions for crossing North Idaho besides the Centennial Trail, I-90, Trail of the Coeur d'Alenes and back on I-90? Josh wasn't there when I got home from work last night. He went to compete in the Bigfoot All-Comers Track Meet at Spokane Falls Community College. Each athlete pays $2.00 and they can compete in any event they want. "What's he doing," I asked Kathy, "The discus throw?" Knowing that Josh is a 5'6", 125-pound distance runner, you might think that to be a nonsensical question. Josh got home around 9:00 pm and we asked how the meet was. "What event did you do?" I asked. I know my son. For the record he threw it 16.3 meters. I wish I had a picture of that. Jonathon Duran is reading the Bible for the first time and posting his thoughts on the chapters as he goes along. I’m merely a layman reading the Bible to try to understand everything an average American can from a holy book revered by a good portion of the world’s population (and certainly a huge portion of the population where I live). I am skeptical about what morals or lessons I’ll find in the Bible, since what I already know about it doesn’t encourage me to think it’s a very moral or holy text. However, if this book is truly God’s message to humanity then an average person should be able to receive the message from the text without struggling to attain the correct mindset or seeking help from another equally fallible human. He makes some very interesting observations. From a Presbyterian pastor's sermon about the murder of Dr George Tiller. Last Sunday morning while we were gathered in worship a gunman entered a Lutheran (ELCA) church in Wichita, Kansas and shot to death the nation’s most famous abortionist, a man whose specialty had long been the dismemberment of late-second and third trimester infants, while he was serving as an usher. A notorious murderer met what is certain to become a notorious end. By the goodness of God the witness of the Church was not entirely silenced in Dr. Tiller’s life. He had been excommunicated by his previous congregation, a church of the Missouri Synod Lutheran denomination. And so the judgment of God had been declared; not every watchman was silent, not every shepherd proved a hireling. But the point was reached where a man despaired of change through government and took matters into his own hand. I do not view the actions of Dr. Tiller’s killer as defensible, but not for many of the easy and often self-serving reasons advanced with alarm and indignation even by many Christians in recent days. Nor do I believe that Dr. Tiller’s killer necessarily acted inappropriately as self-appointed judge, jury and executioner. Hmmm, not defensible but not necessarily inappropriate. It's interesting how some can not only feel less outrage, but are pretty much okay with the death of someone they can make a moral case against. A doctor who performs abortions is shot to death and a criminal in jail dies from multiple taser shocks. How many think, "That's a shame, but they probably got what they deserved." The National Oceanic and Atmospheric Administration just released report on the effects of climate change. It's great they released this report but the PDF, which is great for printing, is overly large. It's a shame they don't have a more user-friendly HTML version. While the primary focus of this report is on the impacts of climate change in the United States, it also deals with some of the actions society is already taking or can take to respond to the climate challenge. Responses to climate change fall into two broad categories. The first involves “mitigation” measures to reduce climate change by reducing emissions of heat-trapping gases and particles, or increasing removal of heat-trapping gases from the atmosphere. The second involves “adaptation” measures to improve our ability to cope with or avoid harmful impacts and take advantage of beneficial ones, now and in the future. Both of these are necessary elements of an effective response strategy. Compare it with the first national assessment. One striking difference is the loss of snowpack in the mountains. Oregon has really taken a hit on this. Two Medford men who burned a cross and the letters "KKK" into the lawn of a mixed-race family will go to prison for violating the family's civil rights. At the federal courthouse in Eugene Tuesday, Chief U.S. District Judge Ann Aiken sentenced Gary David Moss, 37, to 41 months in federal prison while his codefendant, Devan Klausegger, 30, was sentenced to 51 months. While justice certainly appeared to have been served, I do have a slight problem with this reporting. With his statements and those of the woman on Hamilton Street, Medford police got a search warrant for Moss' house. On May 30 they seized fireworks, white gas, empty Mickey Beer bottles, a copy of "The Goebbels Diaries" (written by Hitler's second in command) and a photo of German Field Marshal Erwin Rommel. If you read the entire story you'll see why the fireworks, white gas and empty beer bottles are important. What gets me is the mention of the book and picture. I think this would be notable if this was the only book the suspect owned and the photo was displayed in some sort of exalted manner as opposed to just saying they were seized. I have copies of The Communist Manifesto and Das Kapital but that doesn't make me a communist. Selective choices of books in my humble library could be used to paint me in a number of political, religious, and social colors. Yeah, I'm being persnickety. It's a slow day. In today's Spokesman Review we're told of more planned photo-red installations. The short article does make two important points. Nearly 2,500 $124 tickets have been issued; about 67 percent have been paid, police said. Spokane received $207,700 (so far, out of $310,000) and nobody's complaining about it. Those are very important reasons for not only keeping the photo-red system but expanding it to other intersections. This is a safety program. Automated safety systems have been shown to reduce red-light violations and intersection crashes. Numerous studies throughout the U.S. and worldwide, as well as the experience of many other cities, indicate significant decreases in red-light running violations and collisions after cameras were installed. But there hasn't been one word about the change in the rate of accidents at the intersections. Nothing about a change in the types of accidents. And not a word about the rate of red light violations going up or down at the affected intersections. From other Review articles about photo-red. Under the contract, ATS will charge $4,600 a month for each camera that photographs one approach to an intersection. The money will come out of fees paid by violators. A Spokesman-Review examination of the city’s plans, along with the first-year results of Seattle’s photo-red program, indicate Spokane could collect as much as $500,000 in new revenue even after accounting for operating costs and other variables, such ignored and unpaid tickets. City officials predict it would be far less than that, perhaps $190,000. Four cameras costing $4600 a month each--$147,200 from October 2008 through May 2009--have paid for themselves and generated an additional $60,000 in revenue. Is photo-red making the desired change in safety and traffic violations? How does it compare to extending the length of the yellow light? What are the past and current red light violation rates? What changes have there been in accident rates? What difference does it make? Nobody's complaining and the city made some money. Yesterday we went on a progressive dinner ride with the Spokane Bicycle Club. If Steph looks like she was shirking her stoker duties on the tandem it's because she was. Kathy rode her single and, for a short time only, Josh rode my Trek in a manner not recommended by nine out of ten cyclists who plan on having children. We rode to the first house and had appetizers. At the second house our hosts went way over the top, grilling chicken and burgers and making three types of salads. And a wide variety of desserts awaited us at the last house. All in all it was a very enjoyable day and Steph and Josh each gave it two thumbs up. A couple years ago I posted an image I scanned from an old magazine concerning Gopher. Yesterday I had a conversation with a man who is in his 30's. He was telling me about how he read that the Internet "took off" in 1984, earlier than he thought it did. He was wondering how people got online back them and what was there for them. Remembering that feeling of discovery I felt way back when, I mentioned using FTP and Gopher to access information. That got a blank look. I remembered some guy had a list if FTP sites and every week I'd print that off and use it to find things like guitar tablature for songs. For a while geeks ruled and the Internet was a wonder to most of the population. I mentioned Robert Morris's email worm that crashed the Internet and how exciting it was when Mosaic came out. Fortunately he did not ask me about steam shovels. Doug Clark held his seventh Street Music Week and had plenty of volunteer musicians on hand to raise money for Second Harvest Food Bank. (I know he says it's the sixth one but if the first was in 2003 then the geek in me says this is number seven.) To my surprise I found a friend of mine playing the Irish Pennywhistle. He says this is the first time he has subjected the public to his playing. I didn't feel subjected to it at all. The gentleman playing the saxophone retired from the Air Force in 1972 after serving 20 years as an Air Policeman. He was a joy to converse with. On display at his feet was a photo of himself and his sax from 40 years ago. To him it seemed like yesterday. Next to the bluegrass group I found what must be the world's most exhausted dog. In a note from my sister in Boise she mentioned her son has been taking part in this activity on his fixed gear. The toner cartridge in the copier always needs to be replaced 20 minutes before an office meeting so the handouts can be handed out. When troubleshooting computer problems, the user's initial description of the problem will have no relation to the real problem. As a family we decided to earn shirts with the Flying Irish Running Club this summer. Kathy had to work and Steph bailed on us so Josh and I ran last night. It was kind of like an FBC ride where you had over 100 people show up only without the bicycles and with more physical exertion. So it really wasn't like an FBC ride. But they do have an appealing philosophy: Beer does not negate the effects of running. Running negates the effects of beer. I know, I know. That excludes Josh, but he could still be a designated driver. The good folks at SCOTUS blog have released the preliminary statistics for the 2008-2009 Supreme Court term. With 65 of 81 cases decided so far, the Supreme Court has reversed the often maligned and so-called far left Ninth Circuit Court of Appeals 91% of the time--10 out of 11 cases. No surprise there, right? Interestingly enough the reversal rate for the Third, Fourth, Sixth, Seventh, Eighth and Tenth Circuits, the Court of Appeals for the District of Columbia Circuit, and the Court of Appeals for the Federal Circuit is 100%. Is it too soon to announce the infiltration of "far left activist judges" throughout the appeals courts? I'm just sayin'. Yesterday I saw a news report about an elderly woman being tasered by a policeman. The issue I have with this is the use of force by the policeman involved. Years ago when I was in law enforcement we were trained every year on the use of force. The main rule was to use the minimum force necessary. You had to choose between your wits, self defense training, a night stick or metal flashlight, mace, and your firearm and determine which was the minimum necessary to do what needed to be done. You started with your wits unless circumstances required an immediate escalation, like if the suspect was armed. That seems to have gone away with the advent of tasers. Rather than repeatedly brandish his taser in her face and threaten her with it, he could have easily put this woman up against the car and cuffed her. He's obviously strong enough and she hardly presented a physical threat. Instead he chose to zap her and there really seems to be no reason except for his lack of emotional control and clear thinking. And topping it off by telling a 72-year-old woman he just put down with 50,000 volts, "Put your hands behind your back or I'll tase you again," shows this officer easily disregards more appropriate options. The U.S. Supreme Court just released an interesting opinion in CAPERTON Et Al. v. A. T. MASSEY COAL CO., INC., Et Al. Here's the case in a nutshell. Justice Brent Benjamin of the Supreme Court of Appeals of West Virginia refused to recuse himself from the appeal of the $50 million jury verdict, even though the CEO of the lead defendant spent $3 million supporting his campaign for a seat on the court—more than 60% of the total amount spent to support Justice Benjamin's campaign—while preparing to appeal the verdict against his company. After winning election to the court, Justice Benjamin cast the deciding vote in the court's 3-2 decision overturning that verdict. Because the objective standards implementing the Due Process Clause do not require proof of actual bias, this Court does not question Justice Benjamin’s subjective findings of impartiality and propriety and need not determine whether there was actual bias. Rather, the question is whether, “under a realistic appraisal of psychological tendencies and human weakness,” the interest “poses such a risk of actual bias or prejudgment that the practice must be forbidden if the guarantee of due process is to be adequately implemented.” There is a serious risk of actual bias when a person with a personal stake in a particular case had a significant and disproportionate influence in placing the judge on the case by raising funds or directing the judge’s election campaign when the case was pending or imminent. Just as no man is allowed to be a judge in his own cause, similar fears of bias can arise when—without the other parties’ consent—a man chooses the judge in his own cause. Applying this principle to the judicial election process, there was here a serious, objective risk of actual bias that required Justice Benjamin’s recusal. Chief Justice Roberts makes some interesting points in his dissent. Until today, we have recognized exactly two situations in which the Federal Due Process Clause requires dis­qualification of a judge: when the judge has a financial interest in the outcome of the case, and when the judge is trying a defendant for certain criminal contempts. Vaguer notions of bias or the appearance of bias were never a basis for disqualification, either at common law or under our constitutional precedents. Those issues were instead addressed by legislation or court rules. Today, however, the Court enlists the Due Process Clause to overturn a judge’s failure to recuse because of a “probability of bias.” Unlike the established grounds for disqualification, a “probability of bias” cannot be defined in any limited way. The Court’s new “rule” provides no guidance to judges and litigants about when recusal will be constitutionally required. How much money is too much money? How do we determine whether a given expenditure is “disproportionate”? Disproportionate to what? I did find one of his arguments disingenuous. Don Blankenship spent $3 million dollars on Justice Benjamin's campaign but only gave a direct contribution of $1000. Since Benjamin and his campaign had no control over how the $3 million was spent, Blankenship did not buy a judge nor is there a risk of bias as a result of Blankenship's contributions. I think the court missed an opportunity to clarify the law and perhaps answer Roberts' many questions. I see a parallel in the obscenity cases the court has decided. In a 1964 decision Justice Stewart Potter famously noted, I shall not today attempt further to define the kinds of material I understand to be embraced within that shorthand description; and perhaps I could never succeed in intelligibly doing so. But I know it when I see it, and the motion picture involved in this case is not that. There is no uniform national standard in federal obscenity law. And the legal precedent, the Miller test resulting from a case in 1973, essentially guarantees that something that is legally obscene in one jurisdiction may not be obscene elsewhere. So the First Amendment protections of free speech can vary by location within the U.S., and over time. The basic guidelines for the trier of fact must be: (a) whether 'the average person, applying contemporary community standards would find that the work, taken as a whole, appeals to the prurient interest, (b) whether the work depicts or describes, in a patently offensive way, sexual conduct specifically defined by the applicable state law; and (c) whether the work, taken as a whole, lacks serious literary, artistic, political, or scientific value. I'm not saying it would've been easy, but coming up with language where community standards would determine whether there's a risk of actual bias seems possible to me. Someone in California, Illinois or New York shells out $3 million for a judge's campaign where the $3 million is a small percentage of the total campaign expenditures and then benefits from that judge's decision might not have the risk of bias. Someone in West Virginia shells out $3 million--60% of the campaign expenditures--to get a judge elected and then benefits from that judge's decision in a $50 million appeal. That's obscene. But I'm not a lawyer so what do I know? You're on an elevator with three other people. One of them passes gas. The elevator stops and those three people get off leaving you alone with the reekness. With only three floors left to go you figure you can tough it out. But then the elevator stops at the next floor. Two young children and an adult step inside. Immediately the kids react and one of them asks, "What that stinky smell?" The adult gives you a hard look. Do you say anything? If so, what? After reading this article I have a clear understanding of why we need to keep all those detainees in Guantanamo locked up for as long as possible. Setting them free exposes the shameful truth. "I'm a normal man," said Boumediene, who at the time of his arrest worked for the Red Crescent, providing help to orphans and others in need. "I'm not a terrorist." The 43-year-old Algerian is now back with his wife and two daughters, a free man in France after a Republican judge found the evidence against Boumediene lacking. He is best known from the landmark Supreme Court case last year, Boumediene v. Bush, which said detainees have the right to challenge their detention in court. That decision was a stunning rebuke of the Bush administration's policies on terror suspects. It set up a ruling by District Court Judge Richard Leon, a former counsel to Republicans in Congress appointed to the bench by Bush, that there was no credible evidence to keep Boumediene detained. After what Boumediene described as a 7½ year nightmare, he is now a free man. Boumediene: "I don't think. I'm sure" about torture. I wanted to write about this yesterday but going on a Spokane Bicycle Club ride ate up most of the day. Still, that allowed me more time to mull this over. I've mentioned this fervent young priest at St Thomas More church before. Yesterday he gave a sermon about the unknowable and unfathomable mystery of the single God with three parts. He contrasted that with worldly mysteries which are everything else and how just about every television show has a mystery in the story. Once the mystery is solved we move on to the next mystery. He explained how we should not pursue worldly mysteries but only that of the single mystery. Yet by his own admission that mystery is unknowable and unfathomable. So we are to just accept it and rejoice in it. Then he comes up with this jewel. "Take science, for example," he says with a dismissive attitude. "Look what they do there. They solve one mystery and then move on to another." Now I for one am rather grateful that people like Louis Pasteur, Charles Drew, Jonas Salk, Alexander Fleming, Nicolaus Copernicus, George Washington Carver, Galileo Galilei and many others solved the worldly mysteries they pursued. It's taken a long time, but mankind is far less ignorant than 500+ years ago. And one problem with solving worldly mysteries is that they tend to diminish the unknowable and unfathomable mystery. This priest is an Army reservist and he's being called up to active duty. I wish him the best. While he's serving I hope that at least on one occasion he'll ask why he has to do something or why something has to be done a particular way. I'm guessing there's pretty slim odds of that happening, eh? He doesn't seem like the type to think about things and ask questions. But if he did, more than likely the answer would be phrased differently than, "It is a worldly mystery you need not concern yourself with." They look worse than they feel. The blister was definitely a setback. Mostly because of the tender skin that was exposed when the dead skin covering the blister broke away. My lower leg muscles are really feeling strong now so landing on my forefoot while wearing shoes is working well for me. So if nothing else, it looks like I'm learning a less strenuous running technique. I'm growing impatient with the slow callous growth. In short, nothing new to report except my feet look uglier than before. I ran during lunch last Friday. After a mile I took my shoes off. Another runner stopped me and said, "For a second there I thought you were running with no shoes." Pretty funny. Anyway, he asked me how it was going and I blathered about callouses for a minute and then we went on our respective ways. But there was something that seemed familiar about the guy. It was like he reminded me of someone I've never met before. More fun than the law allows. I most certainly would have benefited from something like this when I was young. When I joined the military I knew nothing about drinking alcohol except you weren't supposed to stop. Although there were a few "incidents" as a result of my drinking--okay, a lot of "incidents"--nobody ended up injured or dead. Was I lucky or what? I'll leave out the details of all the stupidity. There isn't enough room here anyway. As an example to our children, Kathy and I drink moderately and responsibly. We also talk to the kids about responsible drinking and so far it seems to be working. The idea of a provisional license to drink alcohol appeals to me as an opportunity to provide experience which would presumably help young people make better decisions later on. An article in the June 2009 issue of The American Journal of Medicine is certainly appropriate in today's discussion about health care. Lifestyle choices are associated with cardiovascular disease and mortality. The purpose of this study was to compare adherence to healthy lifestyle habits in adults between 1988 and 2006. Analysis of adherence to 5 healthy lifestyle trends (≥5 fruits and vegetables/day, regular exercise >12 times/month, maintaining healthy weight [body mass index 18.5-29.9 kg/m2], moderate alcohol consumption [up to 1 drink/day for women, 2/day for men] and not smoking) in the National Health and Nutrition Examination Survey 1988-1994 were compared with results from the National Health and Nutrition Examination Survey 2001-2006 among adults aged 40-74 years. Over the last 18 years, obesity has increased from 28% to 36%; regular physical activity has decreased from 53% to 43%; and eating 5 or more fruits and vegetables a day has decreased from 42% to 26% among adults aged 40-74 years. Adherence to all 5 healthy habits has gone from 15% to 8% (P <.05). Adherence to healthy habits is no more likely in people with cardiovascular disease, hypertension, diabetes, or hypercholesterolemia. And you have an African-American community, particularly in the poor inner city areas, we're looking at out of wedlock birthrates in three quarters to 75 percent (sic) of children being born out of wedlock. Marriage is an institution that's a bridge too far for too many African-American woman and is not desirable among African-American males. I think he has to realize that flying to New York is self-indulgent. Go down to the corner bar and have a drink, a shot and a beer. It does not matter where you go with your wife, is that it's with your wife. And it is not going to Broadway. All right, once in awhile, you do something special. But it is mundane that really makes the marriage special, but because you are with your wife the mundane isn't mundane. It's special. Pearl Before Swine is one of my favorite comics and today's issue is particularly funny.